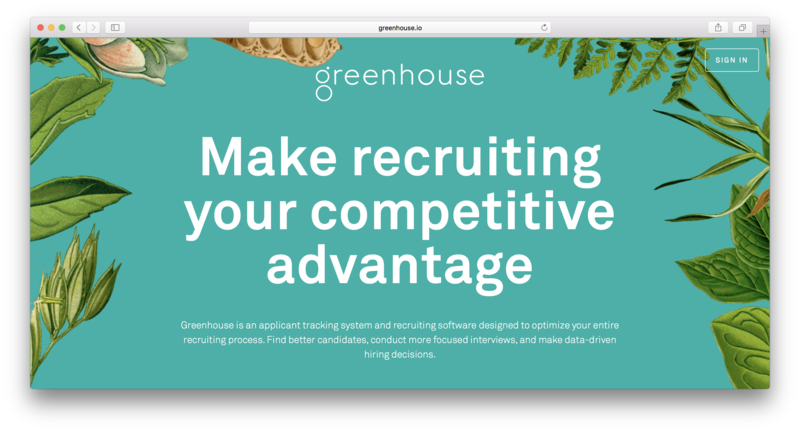 "Greenhouse is a talent acquisition suite designed to optimize your entire recruiting process and make hiring your competitive advantage. " Greenhouse helps make hiring your competitive advantage. Staying a step ahead of the competition for talented people requires company-wide engagement. Thousands of successful companies use the Greenhouse platform’s intelligent guidance to design and automate all aspects of hiring throughout their organizations to win top talent. Much more than an ATS, only Greenhouse delivers a robust software platform that helps you build a winning hiring culture by driving great candidate interactions at every touch point and keeping everyone on the hiring team engaged and on the same page. With Greenhouse, hiring finally becomes a strategic lever in the business, automating away administrative burden and keeping you ahead. Free from the ad-hoc and "one size fits all" approaches of other systems, companies build great hiring plans for every role, which are further tailored for everyone on the hiring team. Proactive, data-driven insights help you shorten time-to-hire today and continue getting better over time. Our passionate customer base of 3,000+ people teams means that when you work with Greenhouse, you are not only selecting software, you are joining a movement of forward-thinking companies with proven success. Chosen by more "best places to work" winners than any other software system, and offering an amazing ecosystem of 150+ technology partners all tightly integrated into the Greenhouse platform, Greenhouse is the industry’s innovation pacesetter year after year. Greenhouse scored 88/100 in the Applicant Tracking (ATS) category. This is based on user satisfaction (82/100), press buzz (49/100), recent user trends (rising), and other relevant information on Greenhouse gathered from around the web. Greenhouse is an applicant tracking and recruiting optimization software solution that allows small- to mid-sized businesses and enterprise recruiting companies to find the best talents for key positions without being bogged down by time-consuming and arduous processes. This ATS and recruiting optimization solution helps businesses find the right candidates for job openings by facilitating the sourcing process, interview, hiring and on-boarding, making sure that all applicants are screened well and meet the criteria and requirements of the company. From sourcing prospects to customized interview kits, Greenhouse aims to help its users find the most suitable applicants, initiate focused interviews and obtain relevant feedback in an efficient and practical manner. With this applicant tracking software solution, your HR team have everything they need to get the best talent possible for the available position. Businesses, enterprise recruiting companies and organizations using Greenhouse are able to find the right people for job openings a lot quicker and easier as it eliminates the time-consuming and laborious process of manually sifting through stacks of resumes and applications. The entire process is made simpler and more convenient through automation and the wide range of programs that come with the software solution. Greenhouse is an integrated recruitment management platform that streamlines many different recruiting processes, which includes sourcing job applications, planning, organizing interview rounds and managing the post-hiring process. With the Greenhouse solution, the hiring process starts with sourcing the right candidates based on your company’s criteria, requirements and job opening. Potential applicants are gathered from various sources including in-house referrals, job portals, recruiting agencies and in-person events. Recruiters and company HR teams can post job openings on job boards or share them on social media, and the system can automatically accept or reject job applications based on the preset selection criteria defined the recruiter or the HR team. One of the main benefits of opting to use Greenhouse as your talent recruitment management platform is the way it makes the screening, interviewing and hiring process a lot more effective and less time-consuming. This software solution can help your company manage its talent pool in a more efficient and practical way. Greenhouse integrates the majority of the recruitment process into a more cohesive system that lets you find the right candidate for the job effortlessly, making sure that you land the most talented and best suited individual for the position you have available. With the Greenhouse solution, you go through the recruitment process step by step, and it starts with the planning. You plan the hiring process, approve new job posts and make sure they are disseminated properly on job portals and social networking sites. With the tools provided by the Greenhouse, you are able to accept applications online, grab more prospects by casting a wider net and boost referrals. Once all applications are collected, the system will then arrange the profiles and the information gathered in such a way that is easy to analyze and prioritize. Once you’ve managed all of the applications, you can start scheduling interviews with the top candidates in your pool. Greenhouse has all the tools you need to make the entire process more manageable and time-efficient. Should you opt for this software solution? Greenhouse is a great applicant tracking and recruiting optimization software solution. It is ideal for businesses and organizations in their growth stages and mid-sized enterprises looking to strengthen their workforce by optimizing the recruitment process. If your company has this specific need, you should definitely try out Greenhouse. Product recommendations, vendor rankings, market overview and tips on how to select Applicant Tracking (ATS) software for business. Published in April 2019.
Who are the main user groups of Greenhouse? Greenhouse is intended for small, medium and large enterprise businesses. Does Greenhouse offer an API? Yes, Greenhouse offers open APIs. What are some applications Greenhouse is commonly used in tandem with? Greenhouse Recruiting is best paired with Greenhouse Onboarding, CRM, Inclusion and the Events App. Does Greenhouse offer guides, tutorials and or customer support? Greenhouse provides FAQs, online chat, customer support, tutorials, webinars, and a knowledge base with documentation. What is Greenhouse generally used for? Greenhouse is everything you need from a talent acquisition suite. It's used by 3,000+ people teams across all business sizes to source, interview, hire, and onboard talent. Does Greenhouse integrate with any other apps? Yes, there are over 250 integration partners in the Greenhouse ecosystem. What platforms does Greenhouse support? Greenhouse supports web-based platforms, including android and iOS. Does Greenhouse offer multi-user capability (e.g. teams)?